We all know the story of Rosa Parks and her refusal to move her tired feet one more step to the back of the bus. So I’m not going to repeat it here. But what I will do is take a moment to acknowledge how easy it is to grow accustomed to being in the back that when opportunities to hit the front arise, they’re missed. Usually I sit at the back or on the sides of large gatherings for many reasons but mainly – kids and bathroom. I have my children with me probably 85% of most things that I do so I’m constantly wrangling, shushing and entertaining while trying to glean experiences (church, meetings, dinner, etc). As for the bathroom, well I have two kids, and my moms out there you already know what carrying babies in your body does to one’s bladder, so there’s that. Last week I attended a leadership and entrepreneurs’ conference. I didn’t have my kids with me; I’d avoided having a lot to drink for the morning so I decided to move up in the room. Not to the front but certainly closer than my usual perch. One of the other attendees looked at me and said, “I’m going to the front. Come on.” I was hesitant, but really there was nothing holding me back except fear, fear of being seen; fear of being held responsible for the view and things that I learned there down front. Mind you, I’ve always been a bit skeptical of people that show up places late demanding a seat in the front. I’m thinking what makes you so special to head down there late, but maybe I should be asking the other way, why are there still open seats in the front? Shouldn’t we all want to be closer to the flames? Don’t we all deserve an opportunity and access? What does it say about us when we don’t move down front? On that day, moving down front was just the start of moving outside of my comfort zone. As a result of taking multiple steps different than my normal path, I was rewarded at a greater level than I’d ever experienced. 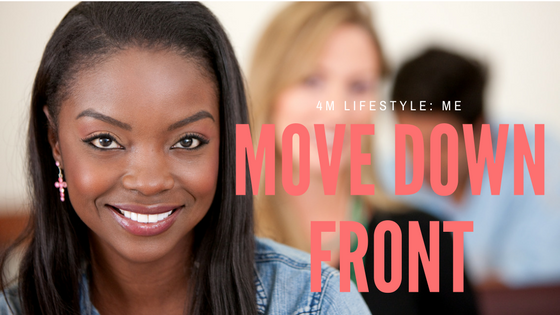 So today I want to you to make a decision to move down front. Is there an area of life where you’ve been sitting in the back for far too long? Drop a comment below. It’s time to move down front in 2018.